Everybody loves a freebie and for the most part the competition posts on Facebook are legitimate. On the flip side though, when you see a giveaway for vouchers from a mega-store, alarm bells should ring. ‘Do this quick survey and we’ll send you a $50 Amazon Voucher!’ – it’s too good to be true. Even one click can take you on a messy journey through the underbelly of the web, picking up trackers and malware at every stop – and at the end, you’re asked to share the post so your friends can get a voucher too…except nobody ever gets the reward. 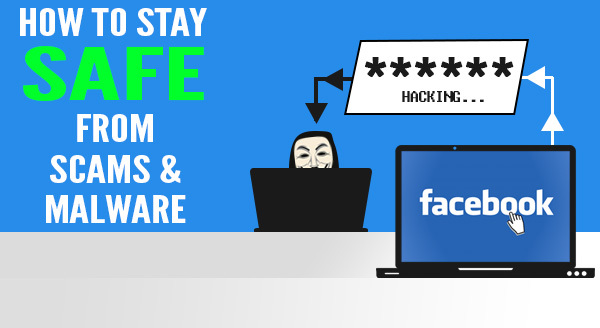 It doesn’t happen very often, but hackers find ways to take advantage of flaws in Facebook. A common hack that keeps popping up in various forms is to embed malware in a link. The virus then infects your machine and contacts all your friends with an enticing message, like asking whether a picture is of them. When they click to view the picture, the virus catches them and their friend list, and so on. Facebook is pretty good at staying on top of these flaws, but they need time to fix it. Just like if you got an odd email with an attachment from a friend – use that same level of scrutiny in your Facebook and don’t open messages or links that seem out of place.